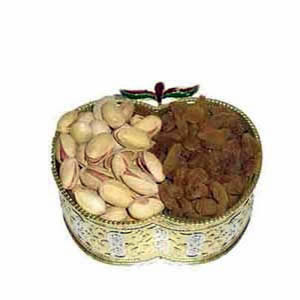 This festive season pamper your loved ones in all cities in India with a pack of dry-fruits. Send 100 gms Pista and 100 gms Raisins filled in Gold plated beautifully designed Apple shaped box. Your dear ones will surely get over-joyed receiving this crunchy dry-fruits. Order this along with other Gifts across India through GiftsAcrossIndia.com and make them feel special.